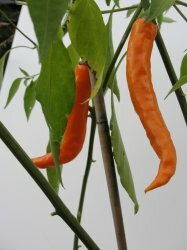 This South American pepper has shiny, greenish/yellow fruits that ripen to yellow/orange to red. Conical wrinkled fruits are dried and ground into powder for use in spicy sauces. Not as hot as the Habanero from the Yucatan.